The MOMentum Network has helped me not only financially with the scholarship, but also helped her be more involved with my son. I was working hard to build a better future for us, but was wrapped up in school and work; Through MOMentum, I realized how valuable and possible it was to spend more time with Anthony while I was in school instead of waiting until after I completed my goals. 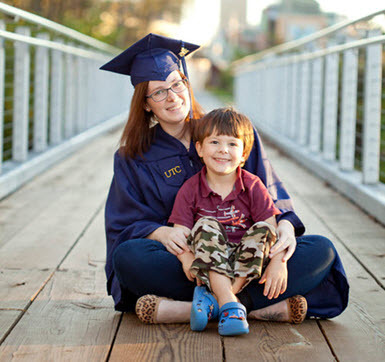 After graduating high school, Andrea moved in with her boyfriend to Chattanooga, dropped out college for a full time job and found out she was pregnant with Anthony. Andrea and her boyfriend stayed together through her pregnancy, and then Anthony became sick at one month old. In the hospital she felt talked down to, and treated as if she was not capable of helping. That’s when she decided she wanted to become a nurse and a good one. It took her 10 months to get back in school after having Anthony. She began when he was 10 months old (2009), and that is when she and Anthony’s father decided that it would not work out because she wanted to go back to school. 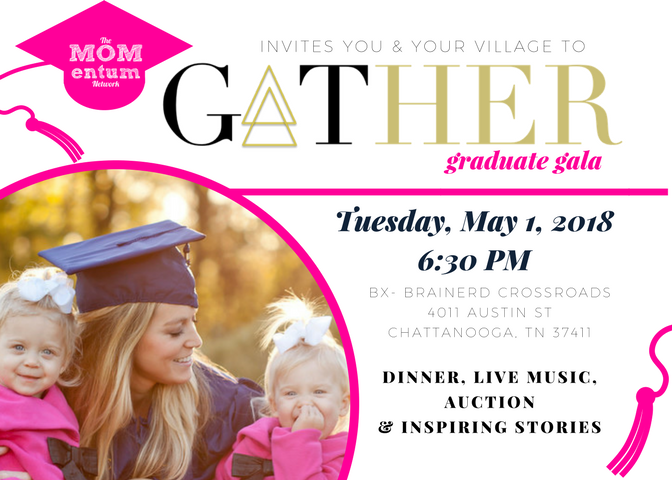 She then moved in with her mother and continued her education at Chatt State then to UTC, and worked multiple jobs while in school to support herself and Anthony. A friend at UTC saw a link for The MOMentum Network on Facebook and sent it to Andrea knowing that she was a single mother. Andrea messaged Cara and talked to her about the program and was encouraged to apply. She gathered all the information necessary and was able to apply in time and was accepted as a scholar! “It’s people that you can go to—for advice, companionship. It’s people you can go to without fear of judgement. People helping people.” Andrea said she had so much help throughout the time she was in MOMentum and now she wants to be there for other moms and let them know how great it is to be part of something. “DON’T GIVE UP. Sleep when you can, just power through it-cause you can do it! Don’t be afraid to go after what you want, because life’s too short. Don’t let being a single mom stop you from doing anything you want to do, you can do it. It is worth it. You do not need a man to complete you, you only need God. You do not need to be married, you only need you and a relationship with God, don’t feel pressured to find a relationship. Focus on yourself and building yourself and your relationship with family and a network. Once you graduate and you get the job you want, you realize that all the sacrifices you made through college have been worth it. You are able to support yourself and your child as well as being able to give back. “I would not have as strong as a relationship with God as I do now.” She had lost her faith, especially after she lost her relationship with her son’s father, she thought she was done. The MOMentum Network has helped her to rebuild a relationship with God and trust in him. The MOMentum Network has made an impact, and shown that even someone that does not know you, will help you and wants you to succeed. Andrea felt alone, and could possibly still feel alone if she wasn’t introduced to this network. She now knows that there are so many people that want to help single moms and it’s ok to have help when you need it, and she now wants to be one of those people and help other single moms- like MOMentum network helped her.